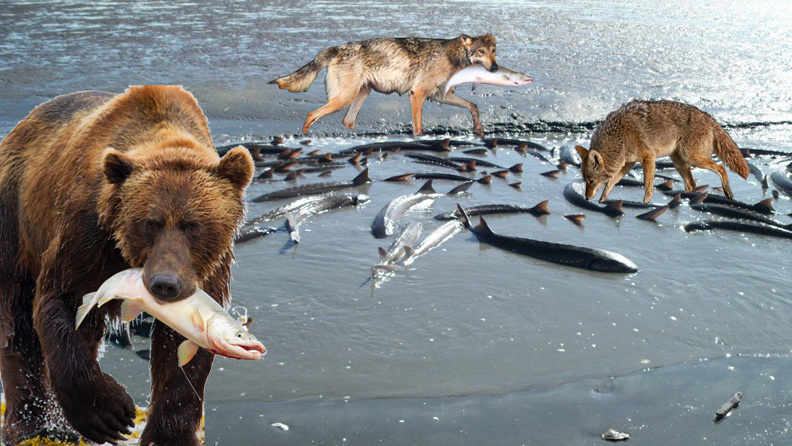 Grizzly Bear, wolf, coyote, competing for tide-beached sturgeon. That old shoreline at Montgomery filled in rapidly as the Gold Rush brought thousands to California, most of whom landed first in San Francisco in 1849 or 1850. After several major fires leveled the instant city over a couple of years, a very substantial brick structure was erected on the intersection of Montgomery and Washington in 1853, known as the Montgomery Block, burying forever the original beach and shoreline that less than 20 years earlier had provided sustenance to bears, wolves, and coyotes. When it was built it was the largest commercial structure in the United States west of the Mississippi River. 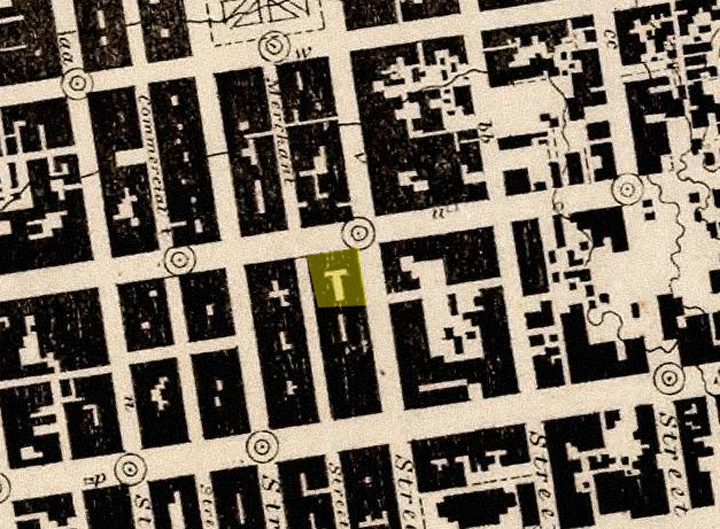 1857 U.S. Coastal Survey Map, showing the Montgomery Block long before the diagonal boulevard (today's Columbus Avenue, originally Montgomery Avenue) was established. 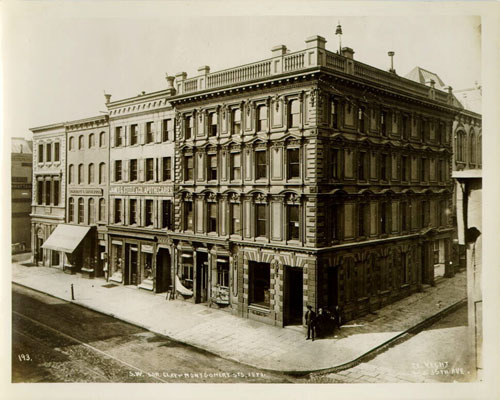 Southwest corner of Clay and Montgomery, c. 1870. 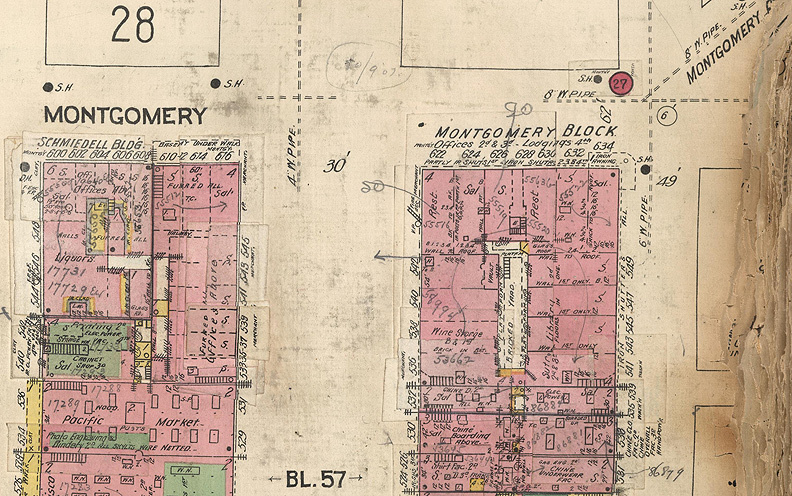 1905 Sanborn insurance map showing in detail the block bounded by Washington and Clay with Montgomery on its west side. Note Merchant Street (alley) bisecting the block. … the huge brick Montgomery Block building served initially as studios and apartments for writers including Mark Twain, Bret Harte, Ambrose Bierce, Robert Louis Stevenson, Jack London, George Sterling, and Emma Goldman. 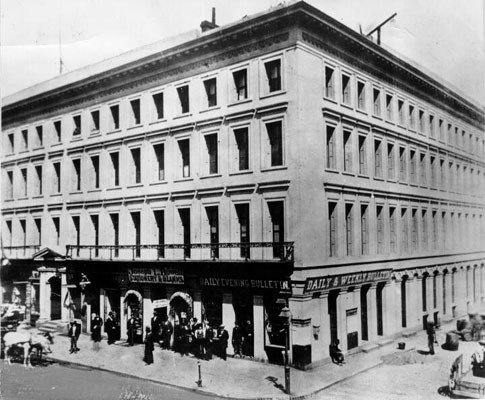 The building miraculously survived the San Francisco earthquake and fire of 1906. 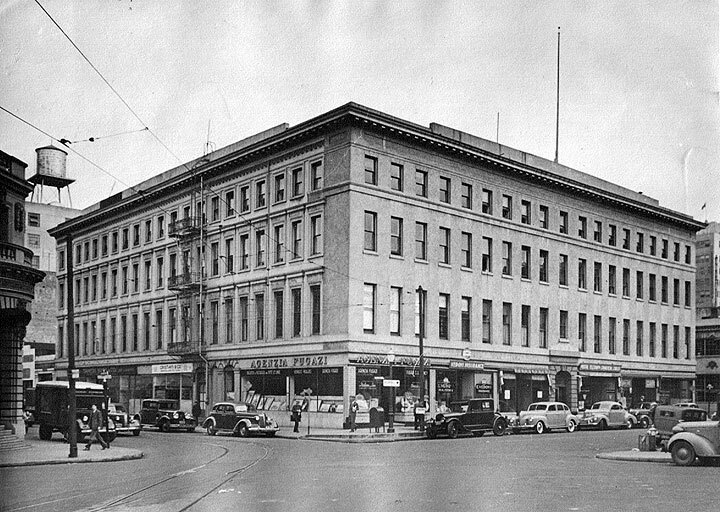 By the 1930s, as many as 75 artists and writers had studios or apartments with rents as low as $5 per week in the building they had affectionately dubbed the “Monkey Block.” They and other artists were part of a lively arts scene that carried over into the bars and restaurants of the surrounding neighborhood. Luminaries such as Diego Rivera, Frida Kahlo, Ralph Stackpole, Maynard Dixon, Dorothea Lange, Benny Bufano and Sargent Johnson were part of this vibrant community which by the early 1930s epitomized the working relationships fostered by the federal government’s programs for the arts. 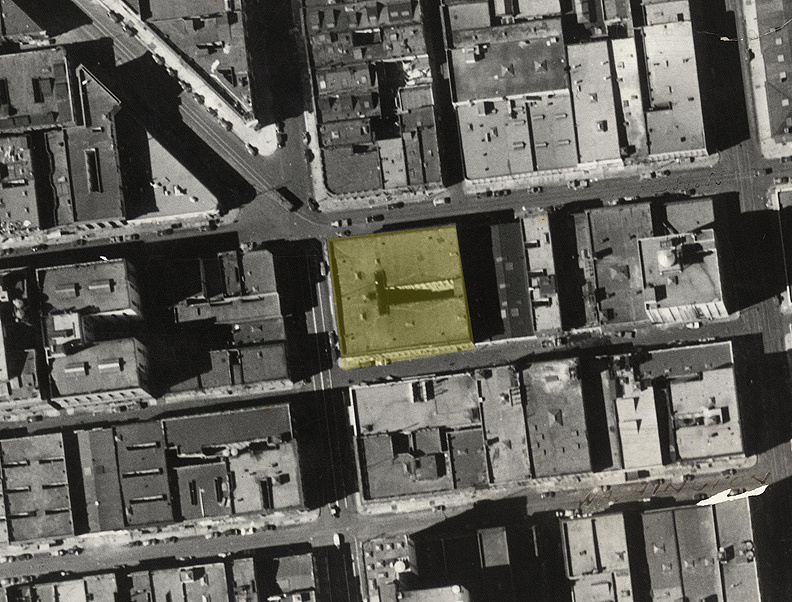 Aerial shot in 1938 of Montgomery Block. 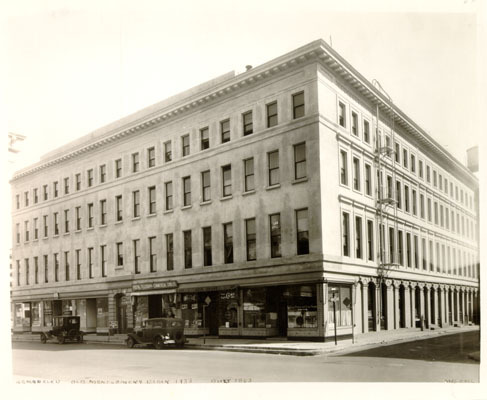 After more than a century of use, the venerable Montgomery Block was torn down in 1959, before any meaningful architectural preservationist effort had begun. City Lights founder Lawrence Ferlinghetti and some other bohemians and beats picketed the planned demolition site prior to its destruction, but to no avail. 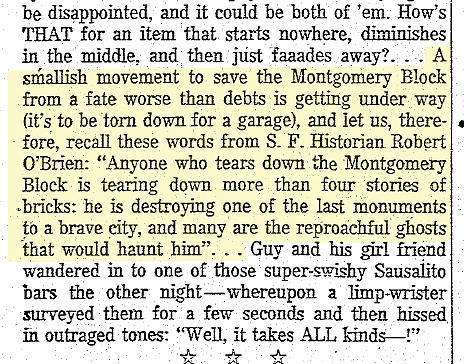 Herb Caen quoted historian Robert O’Brien decrying the impending demolition, while other preservationists rallied to the cause, but as it turned out, to no avail. Herb Caen's S.F. Chronicle column, Jan. 5, 1959. 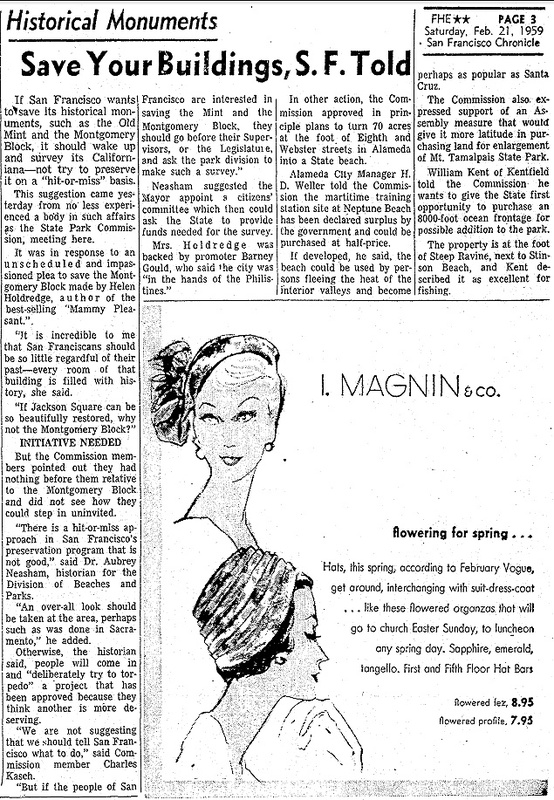 San Francisco Chronicle, Feb. 21, 1959. 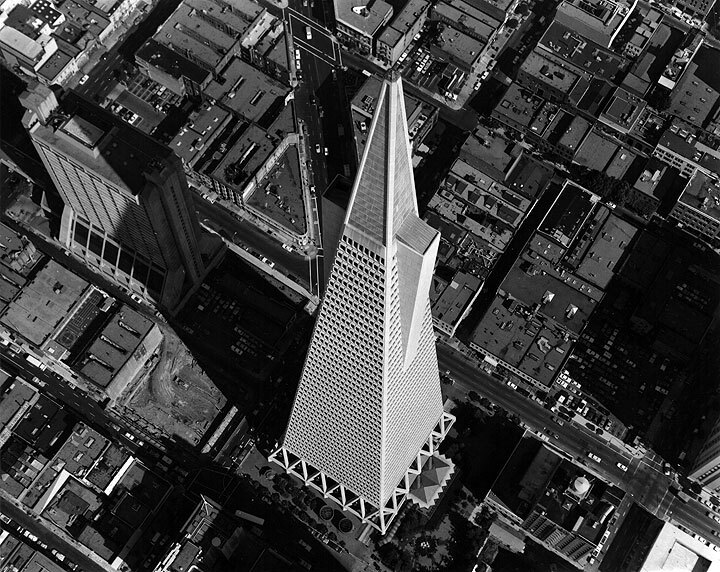 After a decade of serving as a parking lot the Transamerica Corporation proposed to build its iconic pyramid on the site. In order to make it financially lucrative enough, they sought city approval to close various streets and make them part of the parcel on which the pyramid would be built. Following a decade-long process of selling off city streets and rights of way for a fraction of their commercial value in order to facilitate major building projects (e.g. 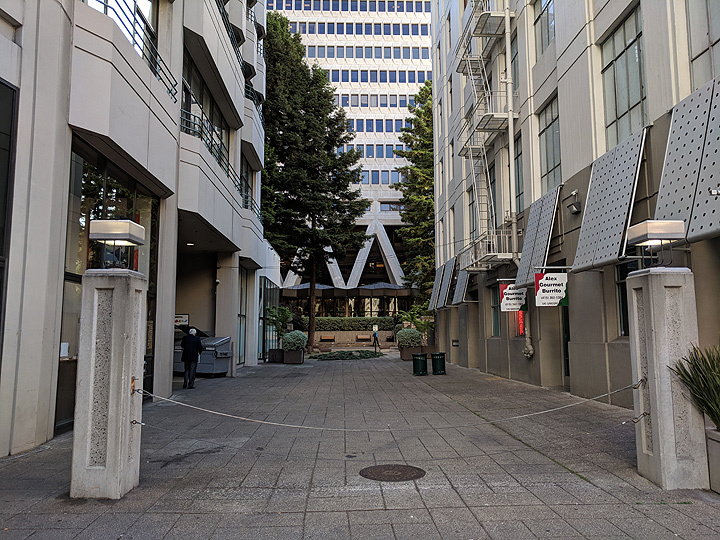 the Embarcadero Center and the Golden Gateway apartments all took over a number of smaller streets to grow the size of their parcels and enlarge the rentable floorspace of their projects), citizens had begun to organize systematic opposition to selling public rights of way. 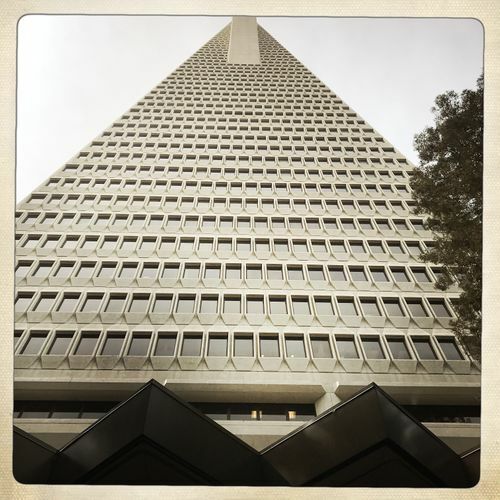 Many objected to the eyesore they saw in the design for the Transamerica Pyramid, and hundreds appeared at an August 25, 1969 Board of Supervisors meeting to oppose approval for the building. According to historian Alison Isenberg this was both the peak of public mobilization and also a decisive loss for its opponents. Mark Twain Place, the renamed stump of former Merchant Street that went through until the property was sold to the Transamerica Corporation for their pyramid. 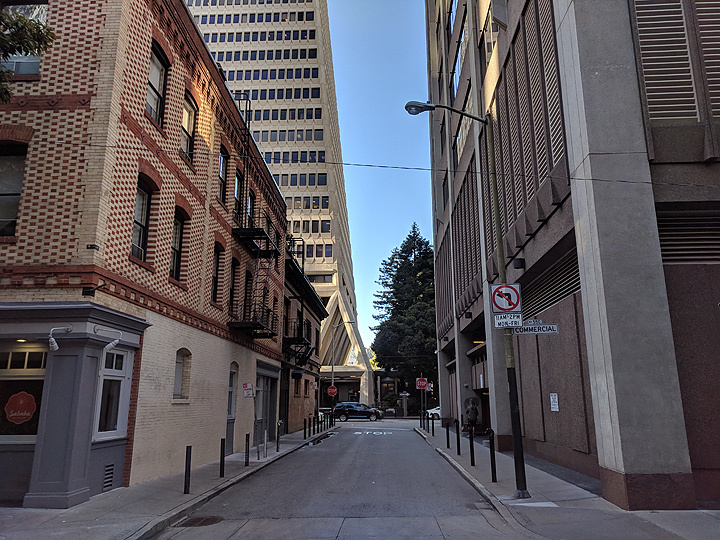 View from Leidesdorff Alley and Commercial Street, looking north towards pyramid. The activism of the Telegraph Hill Dwellers Association (THD), combined with a newer group San Francisco Tomorrow, gave organizational support to the legal challenges. Jean Kortum was a key player in THD and had been active in the Bodega Bay fight over PG&E’s nuclear power plant, the Freeway Revolt, and efforts to preserve height limits and restrict development along the northern and northeastern shorelines.